This resource has been updated to include 5 word wall cards, 5 pairs of matching cards, plus 5 mini-posters in color and grayscale. 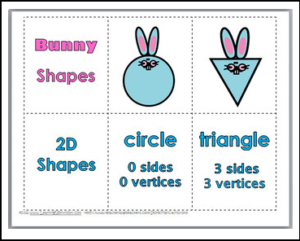 The cards can be used in a Matching Game or Activity, a Pocket Chart Activity, or as a Memory / Concentration Game. The grayscale mini-posters can also be used to make a book for students. The cards can be printed on photo paper or card stock and laminated for added durability. To view more of my 2D and 3D Geometry Products, please click the link below. To view my Math Posters, please click on the link below.